Why Hire a Digital Marketing Director for eCommerce? Winter is just around the corner and before you know it, everything will be covered with white snow. Not everyone enjoys the cold weather (I don’t), but skiers can’t wait to hit the slopes. Let’s assume for a moment you’re in charge of digital marketing at SkiCompany.com and you’ve been informed of a new model of a skis that’s about to be sold online and in-store. You’ve been asked to develop a new digital marketing strategy for this new product in order to help generate awareness and sales. In your company, everyone relies on you to update them on the latest digital trends. You let everyone how excited you are about about new advertising opportunities you plan on testing for this campaign. There are 9 digital marketing channels available you’ve got a lot of work to do. Digital marketers are in need these days because eCommerce is growing year over year. Not only is it experiencing growth but it’s constantly changing. You see, every day, there are new products entering the market and competitors are popping up all over the place. Consumers are changing their shopping behaviours and technology is evolving. Our attention span is limited. Traditional marketing channels such as TV, radio and newspapers no longer have the same impact as they used to. We’re more social than ever and the smartphone has changed the way we consume digital content. Giant billboards are no longer effective since our eyes are constantly glued to smaller smartphone & tablet screens. How do you keep up with all of this when trying to market your products? With so many digital marketing channels out there, how do you budget for campaigns and ensure you’re getting the expected ROI? That’s where digital marketing directors can help struggling retailers. What Does a Digital Marketing Director Do? For me, a director of digital marketing is like a Maestro. In case you don’t know what a maestro is, it’s the person who leads an orchestra with his back to the audience, minus the baton. Obviously, a director does more than simply wave his hands in front of his team but you get the point. He leads a team of digital marketers who help him develop, plan and execute marketing strategies using popular digital marketing channels. Directors usually report to the Chief Marketing Officer (CMO), VP of Marketing or the President/Owner of the company and work closely with all departments within the company such as sales, customer service, operations, creative, merchandisers and buyers. S/he is responsible for sharing with the team and upper management the latest industry trends as well as what new initiatives should the company be considering. The director must empower his or her team by constantly sharing valuable marketing knowledge, resources & tools as well as provide training when necessary. Attending eCommerce and digital marketing conferences is a great way to stay on top of industry changes as well as building a network. A director will develop digital marketing strategies to help jump on new marketplace opportunities, define target audiences, segments, goals, personas, value propositions and specific touch points in order to drive awareness and sales conversions. Someone has to plan those strategies in order to have them executed by the team. Both short & long term planning are needed to effectively generate the expected results. You also need to plan whether or not you will be using your in-house team or outsource; this includes project management, integration, performance monitoring, optimization and reporting. Now that a strategy is developed and planned, it’s time to execute it. A director allocates the required resources in order to move forward. S/he can use team members within the marketing department or outsource to agency partners or consultants. A good director should be familiar with how all channels work. You don’t want to be someone who simply knows the theory and has never gotten his hands dirty. What makes this industry so exciting is the different types of digital marketing channels available to help communicate our message. Those include SEO, PPC, Social, Email, Display & Video Ads, Retargeting, Affiliates, Mobile and content. A director is responsible for leveraging them to their full potential. The only way to improve something is to track its performance and that’s no different for digital marketing campaigns. A director lives by his or her analytics. Numbers will guide every decision and help improve the ROI of current and future campaigns across all digital channels. What skills do you need to become a director of digital marketing? Some of you might be thinking of getting involved in digital marketing because it sounds fun and exciting. It is! Being creative is a must and you need to develop this skill by observing your surroundings (online/offline), watch what competitors do and by taking action every day. Experience will make you more creative. If you want to succeed in digital marketing, you need to love analytics. Numbers matter so much that you will start dreaming about them. Not only should you have skills to help lead a digital marketing team but you must also be able to inspire them & grow. Your team will look up to you. The end goal of your marketing efforts is to have the audience take action and buy what you’re selling. Having sales skills will help you create persuasive messaging and effectively handle common objections shoppers might have. Some people are boring and if you want to be good at what you do, you need to be a good storyteller. This will help you better communicate your message as well as reach out to others within your network. You need to be a fast mover and ready for unexpected changes because eCommerce is constantly shifting. You will have to optimize live campaigns whenever they’re not delivering the expected results. You can’t stay in your own bubble and expect to be the best. You need to be out there. Socialize face-to-face or through social media and meet people. New contacts will open up new opportunities. You need to be able to see the future and have ambitious goals. Believe in yourself, in your team and your product. It will help you move forward and achieve the unexpected. You need to know how to communicate your vision so that there’s a purpose tied to it. Understanding the WHY behind your actions will lead to long-term success. You gotta be hungry for knowledge. Attend conferences, meetups, trainings, courses, webinars, read books/blogs, follow trends. Never stop learning! 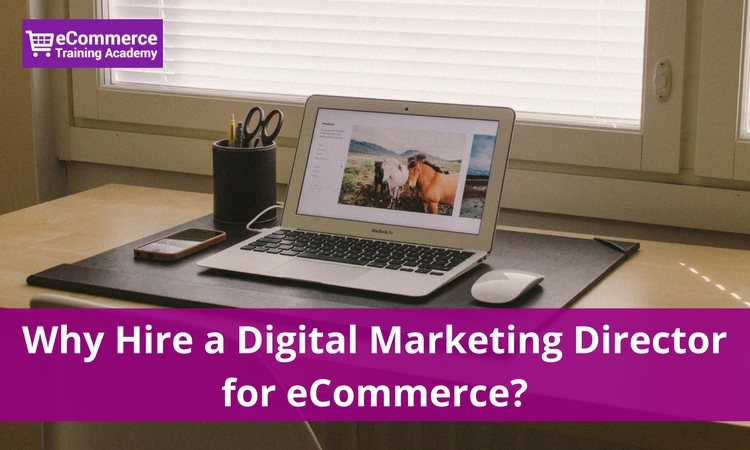 If you own an eCommerce business: Am I ready to hire a digital marketing director? If you work for an eCommerce business: Should our company consider hiring a digital marketing director? Do we have a big enough digital marketing budget to make this position worthwhile (adspend)? There might be other reasons but those are the main ones that justify the need. 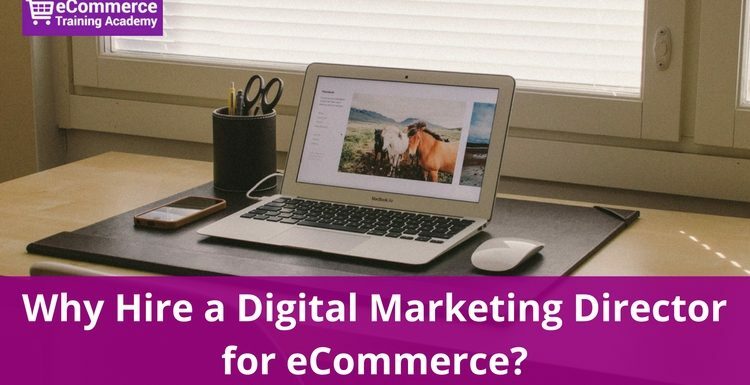 I hope this post has helped you understand the true role of digital marketing directors and figure out when is the right time to hire one for your eCommerce business. Online shopping is not going away. Facebook is here to stay. Technology will continue to evolve. All of this is making a marketer’s job more challenging in addition to consumers constantly changing their online behaviour. Make sure you’re hiring someone with actual eCommerce experience as well as someone who’s using those digital marketing channels on a daily basis. It makes sense that ecommerce marketing would be different than other forms of marketing. It seems like a good idea for a professional to get help with that kind of thing! It’s not something you want to risk doing improperly, after all.